473 Beacon is located on the south side of Beacon, between Hereford and Massachusetts Avenue, with 471 Beacon to the east and 475 Beacon to the west. 473 Beacon was designed by architect John H. Besarick and built in 1889 by David Rand, mason, for building contractor Samuel M. Shapleigh for speculative sale, one of two contiguous houses (471-473 Beacon). In his Houses of Boston’s Back Bay, Bainbridge Bunting indicates that the houses were built for J. Shapleigh, presumably John W. Shapleigh, Samuel Shapleigh’s brother and also a building contractor. However, the original building permit applications, dated March 6, 1889, and the final building inspection reports, dated October 29, 1889, indicate that the owner was Samuel M. Shapleigh (he had originally filed for permits for the two houses on November 19, 1888, but abandoned those permits and refiled in March of 1889). Samuel Shapleigh purchased the land for 471-473 Beacon on October 29, 1888, from Frances Anne (Codman) Sturgis, the widow of architect John Hubbard Sturgis. The lot was part of a 375 foot parcel John H. Sturgis purchased on January 24, 1880, from a real estate investment trust formed by Grenville T. W. Braman, Henry D. Hyde, and Frank W. Andrews. The trust had purchased the land from the Boston Water Power Company on March 1, 1872. The 375 foot parcel was one of three John H. Sturgis had purchased in January and February of 1880 comprising all of the land on the south side of Beacon from a line 198 feet west of Hereford to Massachusetts Avenue, with a frontage of 442 feet. 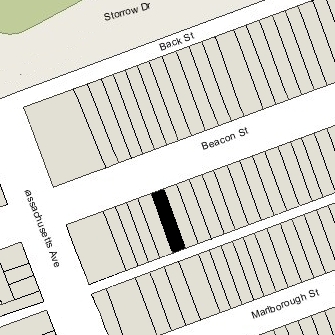 Click here for an index to the deeds for 473 Beacon, and click here for further information on the land on the south side of Beacon between Hereford and Massachusetts Avenue. On April 1, 1890, 473 Beacon was purchased from Samuel Shapleigh by Susan Ada (Hiss) Balderston, the wife of rubber manufacturer John C. Balderston. They previously had lived at 261 Boylston. Their six children lived with them: Helen Balderston, Francis (Frank) D. Balderston, Henry (Harry) Ward Balderston, John Arthur Balderston, Wilson Balderston, and Ada Balderston. Wilson Balderston moved to New York City in about 1895. Ada Balderston married in October of 1899 to Robert Edward Stone of Chicago, where they lived after their marriage. The moved to Boston in about 1908, living first at the Hotel Austerfield at 7-9 Massachusetts Avenue and then at 381 Marlborough before purchasing a home in Chestnut Hill. He was a real estate and insurance broker. Henry Balderston married in June of 1902 to Ethel Harper Bankson of Philadelphia. After their marriage, they lived at 440 Newbury. He was a dealer in cotton goods. John C. Balderston died in March of 1905. Susan Ada Balderston continued to live at 473 Beacon with their three unmarried children: Helen Balderston, John Arthur Balderston, and Wilson Balderston (who had moved back from New York City). Wilson and J, Arthur Balderston were canned goods brokers. Susan Balderston died in April of 1910. In her will, she left 473 Beacon to her six children, with the share for Ada (Balderston) Stone held in trust with Helen Balderston as trustee. 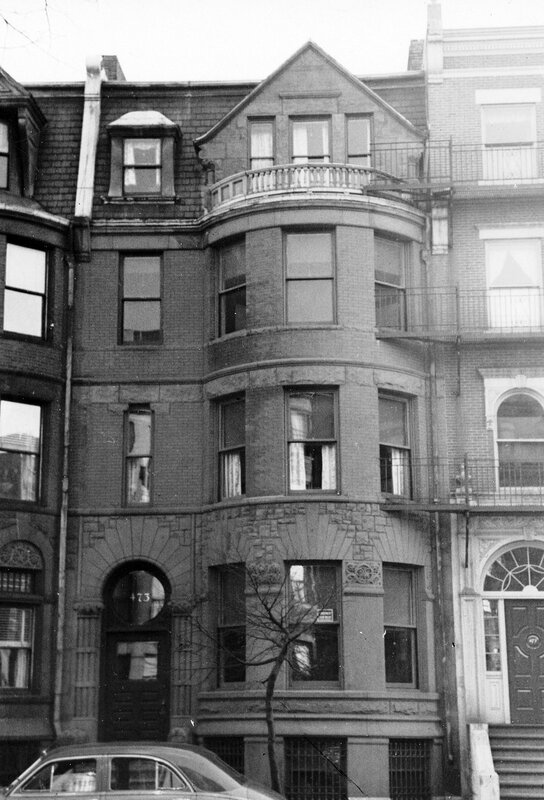 Helen, J. Arthur, and Wilson Balderston continued to live at 473 Beacon during the 1910-1911 winter season, but moved thereafter to 1875 Commonwealth in Brighton. The Balderston family continued to own 473 Beacon and lease it to others. Frank Balderston died in May of 1912 and his share in the property was inherited by his widow, Clara (Banchor) Balderston. 473 Beacon was not listed in the 1912-1914 Blue Books. During the 1914-1915 winter season, 473 Beacon was the home of Mrs. Frances Duer (Jones) Key, the former wife of John James Key. Mrs. Key was under guardianship and, in June of 1914, sought to have the guardianship removed. A June 20, 1914, New York Tribune article described her as “living in a Beacon Street mansion with only a bed, a table, and a chair as furnishings.” Her petition was granted. In November of 1914 she petitioned to resume using her maiden name. Soon thereafter, she married again, to John Tilton. They separated and in April of 1917, she was committed to McLean Asylum in Waverly. 473 Beacon was not listed in the Blue Books after 1915. On September 11, 1916, J. Arthur Balderston acquired Henry Balderston’s one-sixth interest in 473 Beacon, and on December 27, 1916, Helen Balderston, as trustee for her sister, Ada, acquired Wilson Balderston’s one-sixth interest in the property. On May 14, 1918, 473 Beacon was acquired from Helen Balderston, J. Arthur Balderston, and Clara (Banchor) Balderston by Herbert S. Tubbs of Cambridge. The property changed hands and on August 5, 1918, was acquired by Anson G. Cox of Cambridge. On October 7, 1921, the Massachusetts Hospital Life Insurance Company foreclosed on a mortgage it held on 473 Beacon and took possession of the property. On May 1, 1922, 473 Beacon was acquired from Massachusetts Hospital Life by Dr. John Hall Smith, a physician and surgeon. He maintained his office at 473 Beacon and, briefly, he and his wife, Ida Caroline (Stacy) Smith, made it their home. They previously had lived in Cambridge, and by 1924 they were living there once again. In 1914, John Hall Smith had founded the Middlesex College of Medicine and Surgery, initially located in East Cambridge. In 1918, the college affiliated with the newly established University of Massachusetts, Inc. (a private entity and not affiliated with the Commonwealth of Massachusetts) which had purchased the former Volkman School at 415 Newbury. From about 1922, the University of Massachusetts maintained administrative offices at 473 Beacon. Middlesex College of Medicine and Surgery continued to be located in Cambridge until the mid-1920s. On November 20, 1926, it acquired 473 Beacon from Dr. Smith and moved its offices to the house. In the fall of 1927, it purchased the former Baker estate in Waltham and built a new campus, including a castle-like building as its main building. In 1935, it was authorized to grant B.A.. and B.S. degrees and became Middlesex College. In 1937, Middlesex College and the University of Massachusetts, Inc., merged to become Middlesex University. John Hall Smith’s son, Charles Ruggles Smith, became its president. In 1946, it transferred its charter and property to the foundation which subsequently established Brandeis University. The Middlesex College of Medicine and Surgery continued to own and maintain offices at 473 Beacon until the mid-1930s. On June 28, 1935, 473 Beacon was acquired from the Middlesex College of Medicine and Surgery by Mary (Maria) D. (Musante) Basso, the widow of Antonio Basso, of Providence, and on August 21, 1935, it was acquired from her by the Massachusetts College of Osteopathy. Mary Basso’s son, Dr. Joseph Charles Basso, was treasurer of the college. He lived in Somerville. The college continued to be located at 473 Beacon until September of 1939, when it moved to 619-621 Commonwealth to operate in conjunction with the Kenmore Hospital, which had been founded by Dr. Basso. 473 Beacon was shown as vacant in the 1940 and 1941 City Directories. In June of 1941, the College filed for (and subsequently received) permission to convert the property from a school into nine apartments. On December 4, 1951, 473 Beacon was acquired from the college by Dr. Basso. On March 30, 1958, 473 Beacon was acquired from Joseph Basso by Anna E. Kaufman, trustee of The Four Seventy Three Beacon Trust. The property changed hands and on September 30, 1984, was acquired by the Simon-Boyle Group, Inc. (Matthew Simon, president; Robert S. Saunders, treasurer). 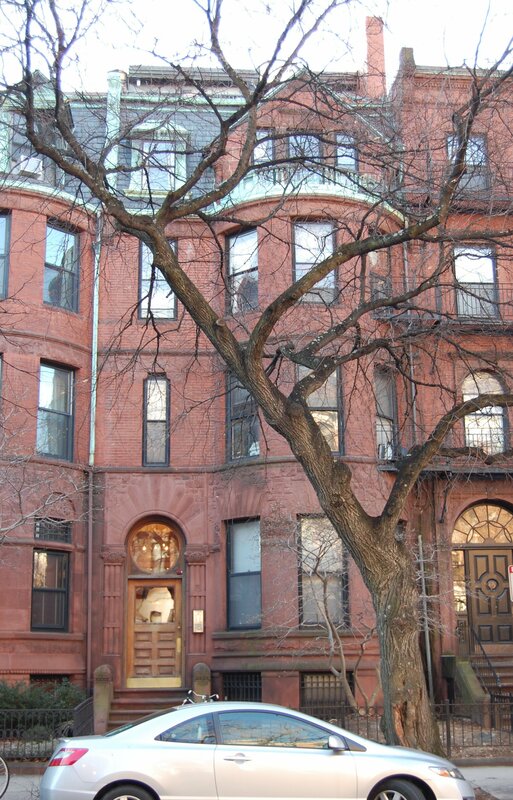 On September 28, 1984, it converted the property into ten condominium units, the 473 Beacon Street Condominium. In May of 1985, the 473 Beacon Street Associates filed for (and subsequently received) permission to change the legal occupancy of 473 Beacon from nine to ten apartments (consistent with the condominium master deed) by reclassifying the existing janitor’s unit as an apartment. In July of 1985, the Simon-Boyle Group applied for (and subsequently received) permission to construct a penthouse to expand the size of one of the existing units.